This massive graphic aviary shows over 740 species of North American birds. Birds of different feathers flock together in this massive graphic aviary. 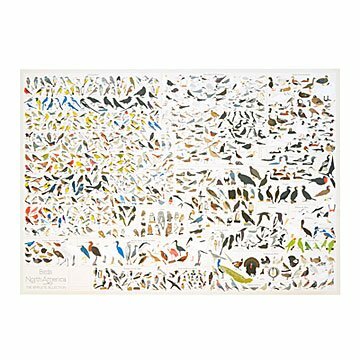 The product of over 400 hours of intricate illustration work, this compendium of over 740 feathered friends is sorted by species and shown in relative scale, covering North America's amazing diversity of birds—from common sparrows to rarer birds such as the California Condor. Designed by Ben Gibson and Patrick Mulligan in Brooklyn, New York. Finding a gift for my dad is always a challenge, as he tends to buy what he wants before we have a chance to put it on our gift lists. I was so excited to stumble on this poster (which I first saw on Instagram) in the last minute hustle for gifts. It's beautiful, unique, and personal, and I felt proud to give it to him! This poster is perfect for educational purposes. I took it in to get it laminated at the local Fed Ex Store so that it holds up over time. I plan to use it for educational purposes--showing ALL of those birds together, sharing that info with students in schools, is a nice addition to our Audubon Educational In-School Programs. It is so well done and beautiful. Nicely detailed. An awesome poster. I loved it. It's a great-looking print, but if there's a catbird on there, I don't see it. If you like catbirds, this might not be the print for you. We LOVE geeking out on this poster! My kids even love it too. It has been so fun to look up birds we see in the backyard. The quality is really great and looks amazing in a black frame. Only thing that might be a problem to someone is that the bird names are pretty small, but my husband and I can read them just fine! Poster is what we expected - a very cool idea and you could spend hours studying it. Had slight creases in the poster board. Nice product but found a typo! We're quite happy with the quality and breadth of this poster, however, after a few weeks, we found a typo. The Green-Winged Teal is listed as Great-Winged Teal. Framed and hung on a wall.